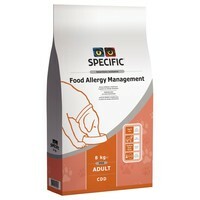 Specific Food Allergy Management CDD Dry Food for Adult Dogs is a nutritionally complete diet that contains a limited number of ingredients in order to avoid symptoms of food and/or ingredient allergy. Made with high-quality ingredients that your dog will find easy to digest, the recipe has been based on ingredients that are less likely to trigger a reaction and is a much more convenient alternative to a homemade hypoallergenic diet. It is also idea for ‘elimination trials’ to help find out what your dog might be allergic too. Specific Food Allergy Management also has a low purine content, a reduced protein level and causes urine to become more alkaline to help reduce urate crystal formation.